Along with such similarly styled outfits as the Goo Goo Dolls, the New Orleans trio Better Than Ezra helped open the floodgates for countless mainstream alt-pop acts of the late ’90s (Sugar Ray, Semisonic, Matchbox Twenty, Third Eye Blind, etc.) by merging rock with melody and creating a more easily digestible form of alternative music for the masses. Originally formed in 1988 as a roots rock outfit with slight elements of country and punk, the group consisted of four college students from Louisiana State University: Kevin Griffin (vocals, guitar), Joel Rundell (guitar), Tom Drummond (bass), and Cary Bonnecaze (drums). The band’s first performances were expectedly held at college bars and fraternity houses, and their debut cassette-tape recording, 1990′s Surprise, received positive press and comparisons to such alt-punk stalwarts as the Replacements and Dinosaur Jr. Despite these accolades, Better Than Ezra’s future was suddenly thrust into doubt when Rundell committed suicide on August 8, 1990. Immediately following Rundell’s passing, the remaining members initially opted to go their separate ways, but by the end of the same year had reunited as a trio. 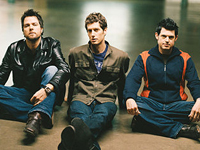 Deciding that a change of scenery would be a smart idea, Better Than Ezra relocated to Los Angeles shortly thereafter, where they laid down tracks at a friend’s home studio to create their 1993 independent release, Deluxe. The album continued to raise the band’s profile and eventually drew the attention of several major labels. The trio eventually signed with Elektra Records, and Better Than Ezra’s new label reissued Deluxe two years after its original release. The album spawned a sizeable radio hit with “Good,” which helped push the album to platinum status by the end of 1995. But despite enjoying a hit right off the bat, Bonnecaze opted to leave the group in early 1996 and was replaced by a fellow New Orleans native (who, at the time, was living in San Francisco), Travis McNabb.